The 57mm ZIS-2 anti-tank gun was adopted by the Russian army in 1943 in time for the Battle of Kursk. This gun was primarily used in an anti-tank role, but high explosive and case shot ammunition were available which allowed the gun to be used against infantry and soft-skinned vehicles too. Unfortunately, the ZIS-2 was not self-propelled. 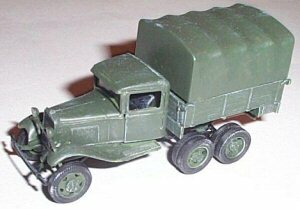 It had to be towed into action and one of the most common vehicles used for this purpose was the GAZ-AAA truck. This type of truck was adapted to a multitude of uses within the Russian army, including armored car, self-propelled gun, and supply vehicle. The kit comes in an end-opening box with an artists drawing of the vehicle in action towing the ZIS-2 57mm gun. On the back of the box are color drawings of the completed kit with the various colors to be used marked with Humbrol paint numbers. Inside are 7 trees of dark green plastic, a bag of black rubberized tires for both the truck and gun and a sheet of clear film for the windows. No decals were included in the kit. Total parts amount to 114 plastic, 14 rubber tires and the one clear sheet. Instructions consist of a series of exploded drawings consisting of 14 steps. Each step has the parts to be used clearly labeled and showing how they are to be assembled. Inside the instruction sheet there is an additional paint chart listing the colors to be used, also shown with Humbrol numbers. Construction of the kit begins with the assembly of front and rear axles, along with the tire and wheel assemblies. Assembly of the chassis continues the first few steps. Everything is pretty straight forward and no problems occurred during the first steps. The only difficulty encountered is the smallness of the parts. This kit seems to have as much detail packed into it as with a 1/35 scale kit. Because of this, there are a multitude of very small parts. Where I ran into some difficulty was with the assembly of the cab in step 6. Here you assemble the entire cab, along with the engine hood and radiator. The instructions show you attaching the radiator to the fender assembly in step 5. The problem here is that when I dry fit this with the engine hood assembly, there seemed to be a pretty evident gap at the bottom where it fits onto the fenders. I ended up assembling the radiator and engine hood pieces together separately and then attaching this entire assembly to the fenders. It fit very well. After this you assemble the interior of the cab, windows and cab sides. Everything seems to be built off of the hood assembly. The next few steps are the assembly of the truck bed and sides. You actually assemble the bed piece by piece. When this is completed you attach the truck bed and cab assemblies to the chassis. There are a few details that are completed beneath the truck, including the muffler, drive shaft and transmission housing. These last few steps are all straight forward. 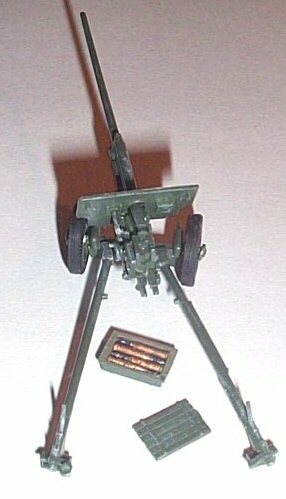 Because there are two separate models in the kit, after construction of the truck you get to assemble the 57mm gun. At first this looked a bit challenging, but the entire assembly was very easy. The gun goes together in the three final steps of the instructions. You can display the kit with the gun deployed, or hooked to the back end of the truck. Also provided in the kit, as added bonuses, are an ammo box, shells and canvas topper for the truck. I painted both the truck and the gun overall with Model Master Acryl Olive Green. I didn’t have to worry about painting the tires, but other details of the truck, including the chassis, bumper and engine, were painted in flat black. Dry-brushing with a lighter color helps to bring out many of the details of the kit. I enjoyed putting this little kit together. Most of the kit is a pretty straight forward build. As mentioned above, the challenging aspects of the kit are the smallness of the parts, the multitude of those pieces, and the assembly of the cab. For these reasons, I would recommend this kit to anyone who has some experience in building small-scale kits. It may be a bit of a challenge for the beginner.